English Roses. Fullers, Innis & Gunn, Dark Island Reserve. Copious amounts of ubiquitous IPA's. 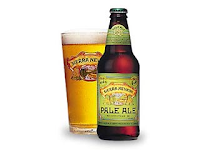 And we have received some Sierra Nevada Pale Ale. Which always I have been rather curious about. I fairly acknowledge the fact that they are in partner with Anchor Brewing as the Mac-Daddys of craft beer. But I always find it interesting how much people are loyal to the brand, even though they they have never been to the brewery, they don't know where Chico is and if you asked them who Ken Greossman and Pual Camusi are, they would think they are B-list Hollywood celebrities. Yet people will drive for kilometres to buy a carton of pale ale that is not that fresh and doesn't really hold a candle up to some of the well made US pale ales being made fresh in our own back yard. I call it 'Sierra Nevada Syndrome'. Take Ben Kraus's Beachworth Pale Ale from Bridge Road down in VIC. This is my new favourite when I'm picking up some burritos form Guzman Y Gomez. The beer has a hazy light orange colour, smells and flavour of light caramel with lashings of tropical fruits which I include grapefruit, hints of passionfriut, and a touch of some orange peel marmalade. Hats off to Ben and thee team for making such a fantastic equivalent to such a famous beer, and one that is undeniably fresher and tastier. However famous Sierra Nevada is, it should resonate that we are making beer that are as equal or better than some in the US.